Are we having a wonderful summer, stamping friends? I wonder what everyone has been up to! I’ve been on two exciting Boy Scout Camp-Outs, spent a week with 400 Scouts at Katahdin Scout Reservation, and had lots of fun days at the lake! I don’t stamp much in the summer because the humidity affects the paper (no air conditioning here in Maine). If you look at the top of the wavy green bottle on my card, made with the Bubble Over Stamp Set, you will see what I mean about the humidity! 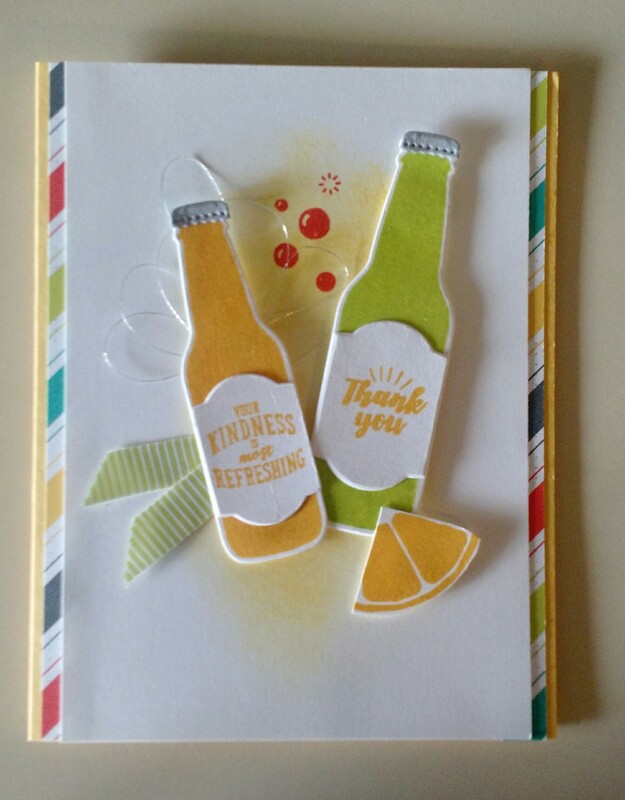 This layout is from a card I saw on Artisan Stamper Charlet Malletts blog “Painted Orange”. She had used Brusho for the background but I instead sponged on some Daffodil Yellow ink, and added some Calypso Coral bubbles. I also added this lemon lime ribbon and a different lemon segment. I love the summery look of this card so much that I made 12 of them! (Six for a Card Swap). I hope you are able to do a little stamping this summer.